The stylish Aosta 3R + 2R Sofa Set boasts sumptuously finished Sued Type Fabric. Available in Tan or Grey with contrast stitching to satisfy a range of tastes. This product is the Aosta 3R + 2R, but the Aosta range is also available in a 3S + 1R + 1R configuration. Please see other products for other configurations. The stylish Aosta 3S + 1R + 1R Sofa Set boasts sumptuously finished Sued Type Fabric. Available in Tan or Grey with contrast stitching to satisfy a range of tastes. This product is the Aosta 3S + 1R + 1R, but the Aosta range is also available in a 3R + 2R configuration. Please see other products for other configurations. 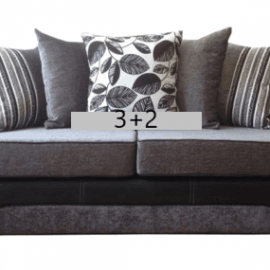 The Bari 3 + 2 Sofa Set boasts beautiful sumptuously finished fabric in black/grey or brown/mink with contrasting cushions. Superb quality sofas with Chrome Feet and Scatter Back. Pattern on scatter back cushions may vary. 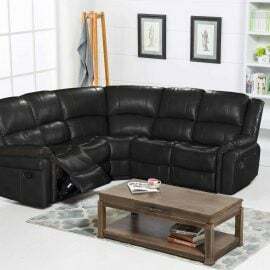 The beautiful Cinque Corner Sofa boasts sumptuously finished Tan or Black Fabric or Black Bonded Leather Air with contrasting stitching, please see other product for Black. Footstool included and available in left-hand and right-hand facing corners. 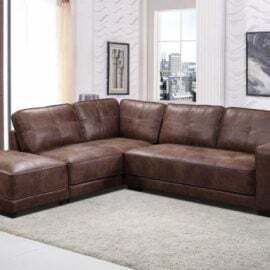 The Madrid 3 + 2 Sofa Set boasts beautiful sumptuously finished and highly breathable Bonded PU Leather. Available in Brown or Black to satisfy a range of tastes. The beautiful Messina 3R + 1R + 1R Sofa Set boasts sumptuously finished and highly breathable Bonded Leather Air with contrasting stitching. Available in Brown, Grey or Black to satisfy a range of tastes. 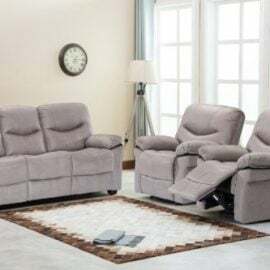 This product is the Messina Messina 3R + 1R + 1R Sofa Set, but the Messina range is also available in a 3R + 2R and Corner configuration. Please see other products for other configurations. The beautiful Messina 3R + 2R Sofa Set boasts sumptuously finished and highly breathable Bonded Leather Air with contrasting stitching. Available in Brown, Grey or Black to satisfy a range of tastes. This product is the Messina 3R + 2R, but the Messina range is also available in a 3S + 1R + 1R and Corner configuration. Please see other products for other configurations. 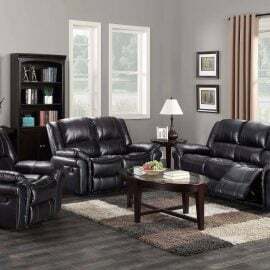 The beautiful Messina Corner Sofa Set boasts sumptuously finished and highly breathable Bonded Leather Air with contrasting stitching. Available in Brown, Grey or Black to satisfy a range of tastes. 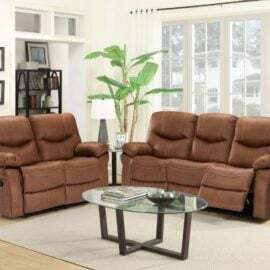 This product is the Messina Messina Corner Sofa Set, but the Messina range is also available in a 3R + 2R and 3R + 1R + 1R. Please see other products for other configurations. The stylish Mika 3 + 2 Sofa Set boasts sumptuously finished Fabric with wooden legs. 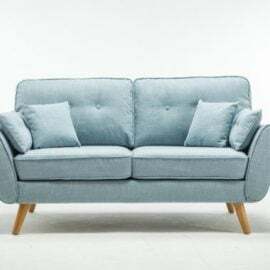 Available in Charcoal Grey or Duck Egg Blue to satisfy a range of tastes.